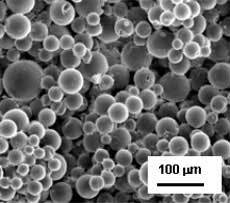 Nanox S2613P feedstock powder is agglomerated nanoparticles with high density and flowability and an average diameter of 30 µm. SEM micrograph typical of Nanox S2613P feedstock powder showing spherical geometry with high flowability. 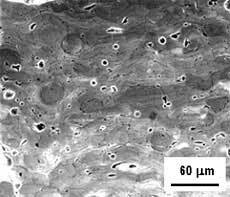 Cross sectional SEM view of a typical dense ceramic coating produced by a Metco plasma gun using Nanox S2613P feedstock powder. Pores (dark spots) occupy only 2 - 5 % volume. 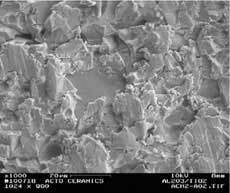 SEM micrograph of worn surface typical of conventional alumina/titania coating. Note: large "plate like" pieces were removed by wear resulting in grain "pull-out." 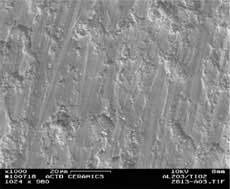 SEM micrograph of worn surface typical of nanostructured alumina/titania coating made from Nanox S2613P feedstock. Smaller pieces were removed resulting in polishing of the coating surface. The information and recommendations contained in this publication are based upon data collected by Inframat® Corporation and believed to be correct. However, no guarantee or warranty of any kind, expressed or implied, is made with respect to the information contained herein, and Inframat® Corporation assumes no responsibility for the results of the use of these products and processes described herein. No statements or recommendations made herein are to be construed as inducements to infringe any relevant patent, now or hereafter in existence.